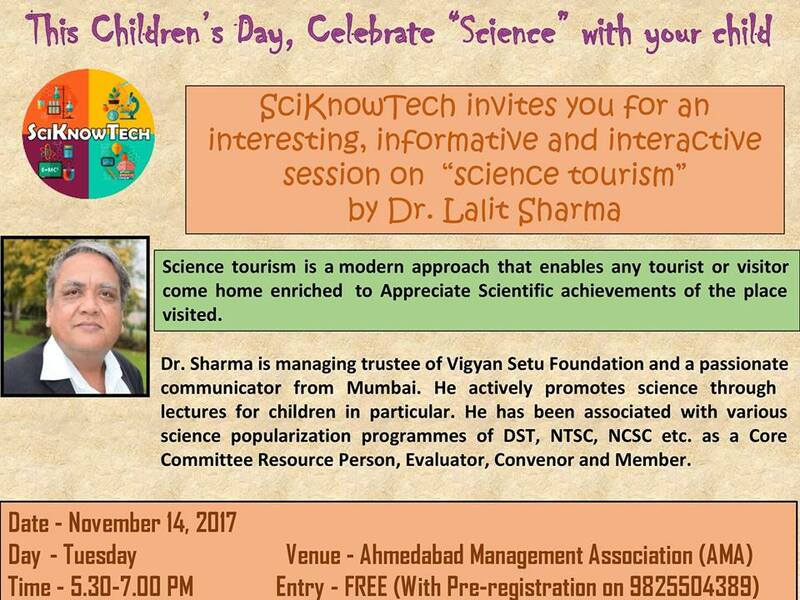 On this Children’s Day, SciKnowTech hosts Mr. Lalit Sharma from Mumbai to present for the first time in Ahmedabad, a session on “Creating Awareness about Science Tourism”. “Science tourism” is a modern approach that enables any tourist or visitor come home enriched to Appreciate Scientific achievements of the place visited. Dr. Sharma is managing trustee of Vigyan Setu Foundation and a passionate communicator from Mumbai. He actively promotes science through lectures for children in particular. He has been associated with various science popularization programmes of DST, NTSC, NCSC etc. as a Core Committee Resource Person, Evaluator, Convenor and Member.